The name "Nielsbohrium" was suggested not once, but twice for newly discovered elements. Both times: rejected! The name comes from theoretical physicist Niels Bohr, and one of the rejected elements did end up being named after him (just Bohrium, sans the Niels). Well, 14 years later, the name Nielsbohrium finally found a home in, quite frankly, a much awesomer substance. Beer Nerd Details: 10% ABV bottled (750 ml capped). 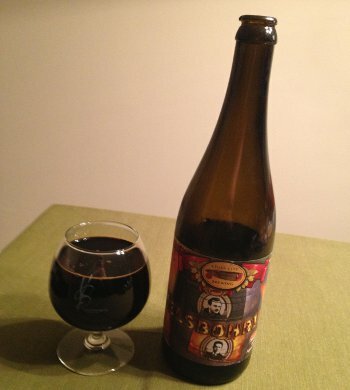 Drank out of a Voodoo snifter on 5/4/13. Well, that certainly went a lot better than my last Rum Barrel Aged beer! Cigar City continues to impress. I was a little worried about how old this one was, but I suspect it has held up remarkably well (I never had it fresh, but in my experience, sweet stouts age well). This page contains a single entry by Mark published on May 9, 2013 10:28 PM. Quick Hits was the previous entry in this blog. Cantillon Gueuze is the next entry in this blog.